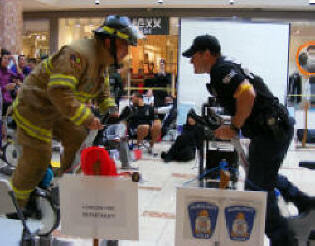 The 911 Clash for a Cause was created by members of the London Police Service and London Fire Department – combining a common fundraising goal with friendly competition between teams from around the community as they ride 24 hours non-stop on stationary bikes. This year’s event took place beginning at noon on Friday November 4 through to noon on Saturday November 5, 2011 at Chiefs on Bikes Masonville Place Mall in London. Funds raised were gathered through collecting advanced sponsorships and donations during the event. The 911 Clash for a Cause Committee is proud to announce that the event has raised over $25,000 (and still counting) in support of the Neonatal Intensive Care Unit (NICU) at Children’s Hospital, London Health Sciences Centre – to help purchase life saving monitors for the NICU which help care for over 700 critically ill and per-term infants each year. A special thanks to all our sponsors who generously donated and supported the event. Honorary mention to the following teams who participated in our event and made this all possible. via 911 Clash for a Cause raises $25,000.